The Antiques Anonymous Flea Market is an extravaganza organised by the art and antique dealers of Church Street, Marylebone and Alfies Antique Market. Now in its second year, it is a brilliant event that makes Church Street a focal point for vintage and design fans looking for unique items of jewellery, clothing and furniture. 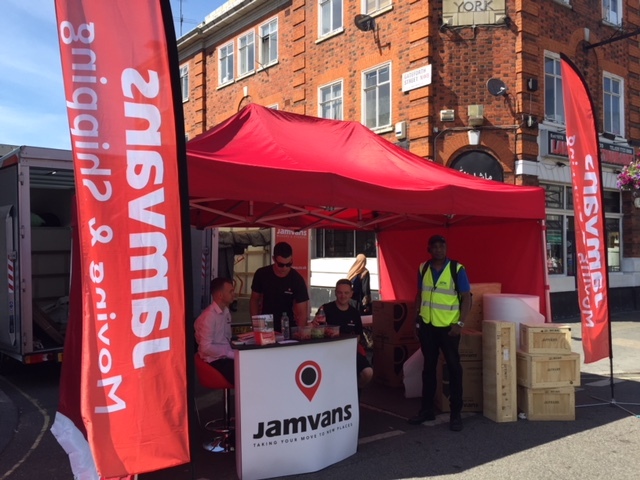 JamVans had been invited to attend by one of the organisers Young & Sons who had seen our removal vans around London and know we have a great reputation for fine art and antiques shipping and moving. This meant that all the successful buyers could relax knowing that their new purchases would be delivered safely and securely with delivery the same day or the following week depending on their requirements. 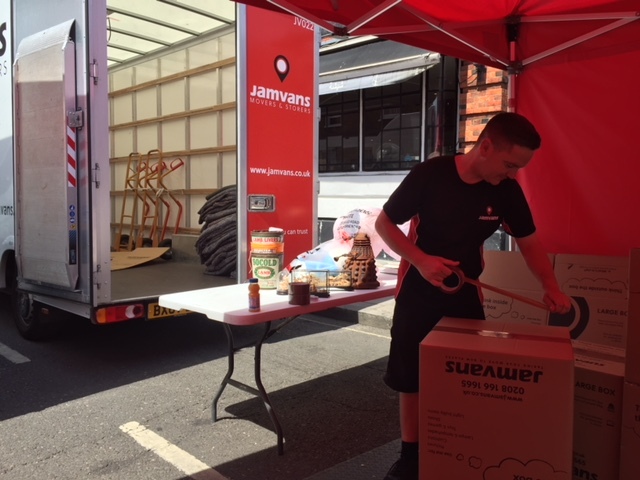 Four of the JamVans crew arrived early and set up our stand. We’d been allocated our very own security guard who kept us company and entertained us all day. Luckily we’d brought the gazebo or we might have roasted in the sun. Church Street itself has a wealth of history having hosted a market that started in the 1800s. It has become an internationally renowned hub for antique shops and art galleries and is now the focus of one of Westminster Council’s regeneration plan. The 80 antiques and art dealers who collaborated to create the market ensured there was a huge variety of unusual and rare quality, decorative items. You can see some of the photos from the day on the Antiques Anonymous Facebook page. 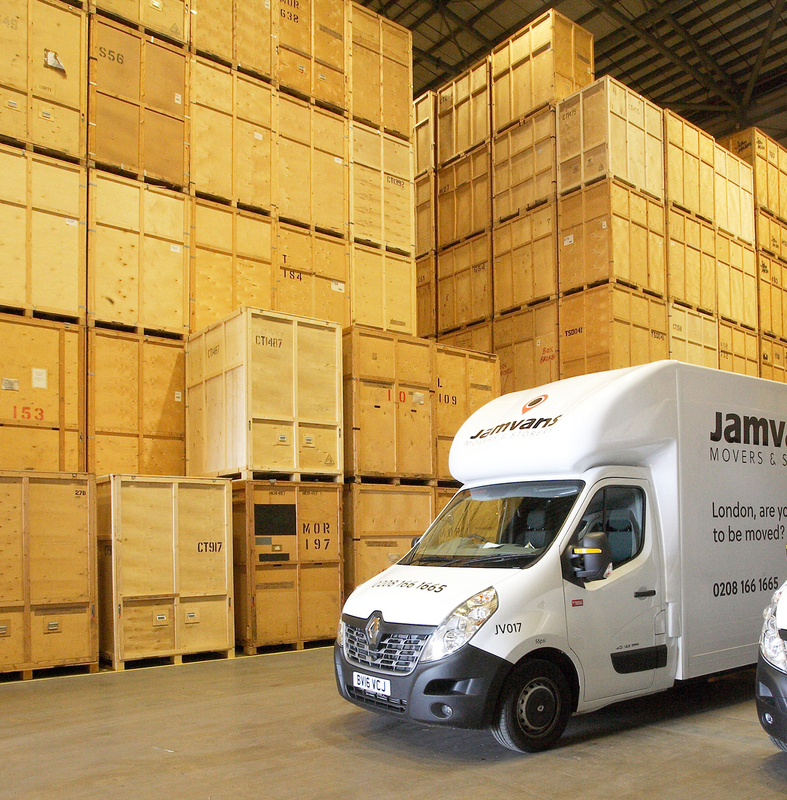 Initially we were stacked high with crates, boxes, bubble wrap and export wrapping, but soon we had a steady stream of customers to wrap, pack and organise delivery of their precious antiques and artwork. Some customers wanted delivery for later that day, and for others we utilised our storage with instructions to deliver later in the week. We were also able to organise international delivery using our regular air and sea freight services, with full insurance, arranging import and export documentation and customs clearance. 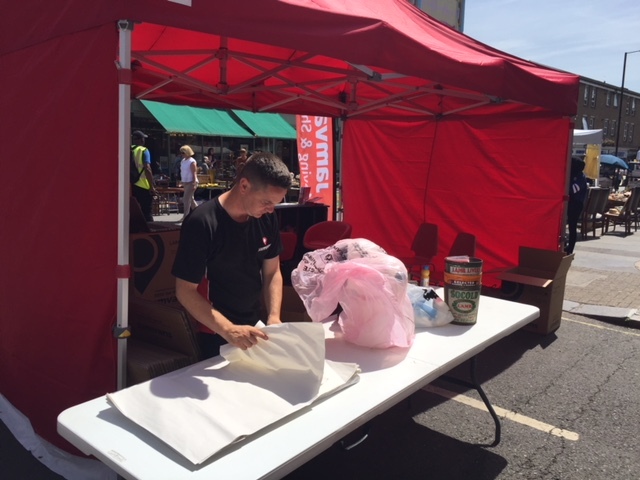 Not only was there the massive range of contemporary designs, antique furniture, jewellery and clothing, but there was also entertainment with live music and exhibitions, and delicious artisan street food served from pop up stalls. We had a great day, and even managed to watch the World Cup football as we’d pre-planned to stream it from our laptop. The football was also shown in the local pubs The Traders Inn and Lord High Admiral, which only added to the great atmosphere!